Renowden played his 250th 1st XV match for the club while Ed Hannam scored twice as he celebrated a century of Kenilworth appearances in a tense local derby. 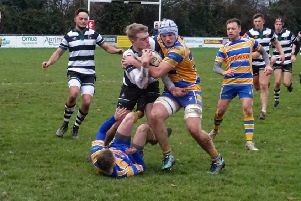 Alex Selby feels the force of two Leamington tacklers. The result means Kenilworth remain top of the Midlands Two West (South), level on points with Kidderminster, after eight wins from nine matches. A few minutes in, Kenilworth winger Ollie Burman and skipper Bobby Thompson collided trying to tidy up a loose ball following considerable early pressure from an enthusiastic and very competitive Leamington team. Both players had to leave the field for touchline treatment and were replaced by Josh O’Brien and Tondi Mpambawashe, respectively. Leamington continued to press but the home side’s defence held strong and Kenilworth eventually worked their way into the visitors’ half. Although now seeking to take hold of the match, Kenilworth made things difficult for themselves as mistakes started to creep in. The hosts were boosted when the visitors were reduced to 14, with a player somewhat harshly sin-binned for a high tackle. A few minutes later it was Kenilworth who were at the wrong end of the referee’s decision-making when he refused to allow skipper Thompson to return to the pitch following treatment on his shoulder, the referee deciding it was not a shoulder injury but a head knock. That setback aside, Kenilworth continued to put pressure on Leamington and were rewarded with a penalty in front of posts from Josh Emery which took them into the half -time break with a slender three-point lead. Ten minutes into the second half Kenilworth started to put one or two phases together and the first indication of their ability to run the ball could be seen when full-back Garrett Bell joined the line on the right to grubber kick towards the Leamington 22. With good ground having been made, Kenilworth continued to press and were rewarded when lineout ball was won five yards out. Quick ball to the backs then saw Hannam run a great straight line to take a short pass and touch down under the posts. Emery successfully converted. Leamington continued to fight hard and their midfield pressure was rewarded with a penalty that they kicked to the corner. Following a successful catch and drive, the visitors eventually burrowed over the line for an unconverted try from Gareth Shuttleworth. Kenilworth responded well, benefiting from a harsh decision to yellow card one of the Leamington forwards, with the subsequent penalty slotted over to make it 13-5. From the restart, Sam Harrison caught the ball and made considerable ground towards the Leamington 22. Kenilworth remained deep in the visitors’ half and were further rewarded with their second try of the match. After two or three phases, scrum-half Gareth Renowden offloaded to centre Charlie Stevens who fed Ed Hannam on Leamington’s 22 and the centurion outran the chasing defence to touch down to the right of the posts. Emery again added the extras before Kenilworth closed the game down in the final few minutes.